Google quietly announced on Google+ a new report and bidding option based on distance of the searcher to your location. 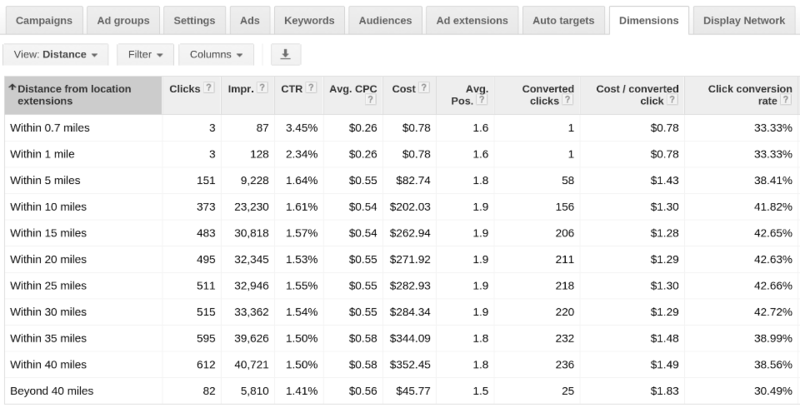 The new report shows you impressions, clicks, conversions and more based on the searcher to your local business in miles. This way you can see if customers closer to you are more likely to convert over customers much further away. In addition, Google is expanding their location extension bidding options to let you bid differently, within the same campaign, for customers who are closer versus further away. Google AdWords Distance Report For Location Extensions: The distance report for location extensions provides insight into where your ads with location extensions are most effective. It shows impressions, clicks, and costs for varying distances around your business locations, from 0.7 miles to greater than 40 miles. This data can help inform decisions like whether to set a higher bid for customers within four miles of your business, or a lower bid for customers who are 20 miles away. You can find this report on the Dimensions tab in your account. Google AdWords Distance Bidding Options For Location Extensions: Improved targeting options offer more flexibility for optimizing your targeting and bid adjustments for location extensions. Setting the right radius for your location extension address is now easier. Previously, all location extensions in a campaign used the same target radius. With this update, you can create location extension with different radii for targeting and bidding based on the location of your businesses. Learn more about this option over here.